Scottish Tea Time Selection is an exquisite range of classic Scottish food and drink. 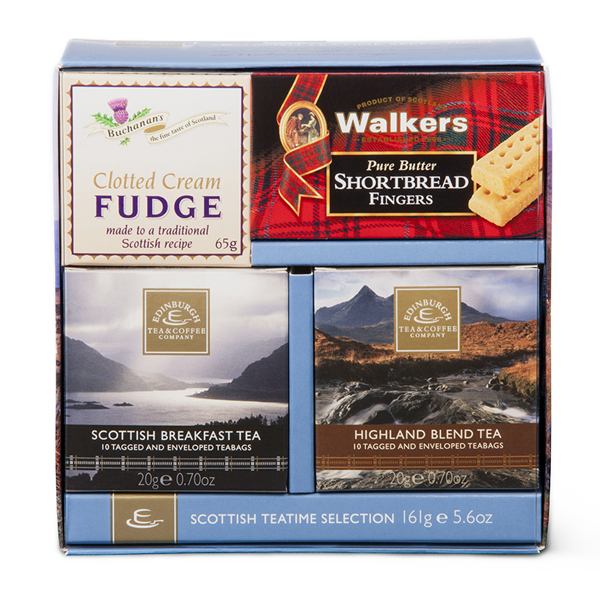 This includes the finest Scottish Breakfast Tea, refreshing Highland Blend Tea, delicious Walkers Shortbread Fingers and Buchanan's traditional Clotted Cream Fudge. Edinburgh Tea and Coffee are fully certified by the Fairtrade Foundation and the Organic Food Federation to roast and pack coffee and blend tea. Delicious traditional Scottish shortbread, handmade in Scotland to Chrystal's family recipe. This light and buttery traditional hand-made shortbread is impossible to resist. Ceramic mug featuring a bagpiper dressed with the traditional tartan, one of Scotland's most famous symbols. Scottish Breakfast Tea made of a traditional full-bodied blend of the finest teas from Assam, Ceylon and Africa. This brews a rich golden cup of tea with strength and liveliness to waken the taste buds.